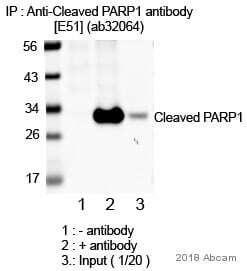 This antibody is specific for the p25 cleaved form of human PARP1. Synthetic peptide within Human Cleaved PARP1 aa 150-250. The exact sequence is proprietary. 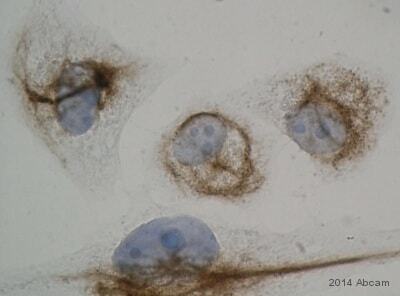 WB: Jurkat whole cell lysate (ab7899), Wild type HAP1 whole cell lysate. 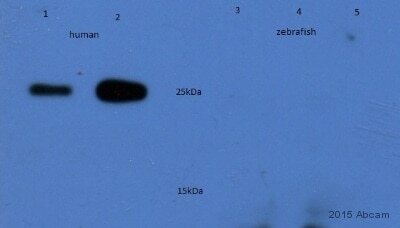 HeLa and RAW 264.7 whole cell lysate. NIH/3T3 and PC-12 treated with 1uM Staurosporine. Jukat cells treated with camptothecin. 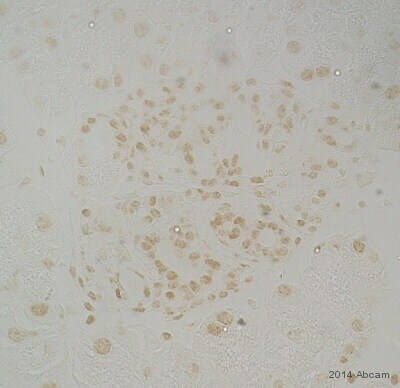 Jukat cells treated with 15-Acetoxyscirpenol. IHC-P: Rat colon tissue. Human ovarian cancer and breast carcinoma tissue. Our Abpromise guarantee covers the use of ab32064 in the following tested applications. Lanes 1 - 4: Merged signal (red and green). Green - ab32064 observed at 30 kDa. Red - loading control, ab8245, observed at 37 kDa. ab32064 was shown to specifically react with PARP1 when PARP1 knockout samples were used. Wild-type and PARP1 knockout samples were subjected to SDS-PAGE. Ab32064 and ab8245 (Mouse anti-GAPDH loading control) were incubated overnight at 4°C at 1/10000 dilutions. Blots were developed with Goat anti-Rabbit IgG H&L (IRDye® 800CW) ab216773 and 680CW Goat anti Mouse secondary antibodies at 1/10000 dilution for 1 hour at room temperature before imaging. Jurkat (Human T cell leukemia cell line from peripheral blood) cells were incubated at 37°C for 24 hours with vehicle control (0 μM) and different concentrations of 15-Acetoxyscirpenol (ab142381). 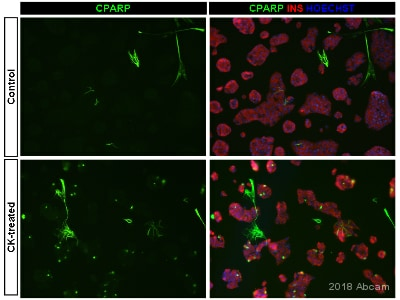 Increased expression of cleaved PARP1 (ab32064) in Jurkat cells correlates with an increase in 15-Acetoxyscirpenol concentration, as described in literature. Whole cell lysates were prepared with RIPA buffer (containing protease inhibitors and sodium orthovanadate), 20μg of each were loaded on the gel and the WB was run under reducing conditions. After transfer the membrane was blocked for an hour using 5% BSA before being incubated with ab32064 at 1/10000 dilution and ab8227 at 1 μg/ml overnight at 4°C. Antibody binding was detected using an anti-rabbit antibody conjugated to HRP (ab97051) at 1/10000 and visualised using ECL development solution. Immunohistochemical staining of paraffin embedded rat colon with purified ab32064 at a working dilution of 1/100. The secondary antibody used is a HRP polymer for rabbit IgG. The sample is counterstained with hematoxylin. Antigen retrieval was perfomed using Tris-EDTA buffer, pH 9.0. Immunohistochemical staining of paraffin embedded human ovarian carcinoma with purified ab32064 at a working dilution of 1 in 100. The secondary antibody used is a HRP polymer for rabbit IgG. Counterstained with hematoxylin. Antigen retrieval was perfomed using Tris-EDTA buffer, pH 9.0. Immunohistochemical staining of paraffin embedded human breast carcinoma tissue with unpurified ab32064 at a 1/100 dilution. Lane 1 : Untreated Jurkat (Human T cell leukemia cell line from peripheral blood) cell lysate. Lane 2 : Jurkat cell lysate. Publishing research using ab32064? Please let us know so that we can cite the reference in this datasheet.